In this mini project of the street light circuit using LDR, we are going to operate street light using a light dependent resistor (LDR). The purpose of this mini project is to switch off the street light in the day and switch on the street light in the night. 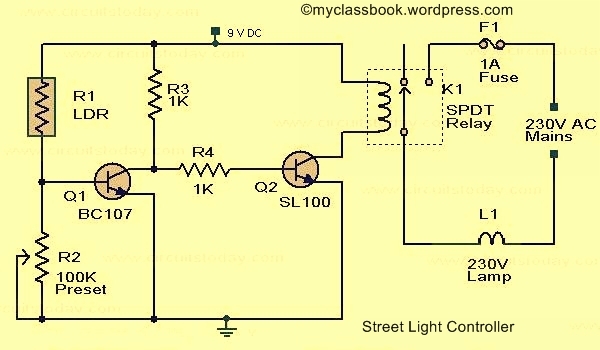 The following figure shows the circuit diagram of the street light controller using LDR. Here we have used a 230V lamp which will turn on in the night and get turned off during the daytime. Light dependent resistor i.e. LDR is the main component used in this mini-project. We know that the resistance of the LDR decreases as the intensity of the light increases and vice versa. The Same principle is used here. When there is the presence of light the resistance of LDR will be low. So the voltage drop across the pot R2 will be high, which keeps the transistor Q1 on. The collector of Q1 (BC107) is coupled to the base of Q2(SL100). So Q2 will be OFF and so do the relay. The bulb will remain OFF. Similarly at night the intensity of light decreases and resistance of LDR increases. Therefore the resistance of pot R2 decreases below 0.6V. This makes transistor Q1 OFF which in turn makes Q2 ON. The relay will be energized and the bulb will glow.